The Armed Garden and The Veiled Prophet appeared in the Winter and Spring/Summer issues of MOME, Fantagraphics’ otherwise unremarkable comics anthology. 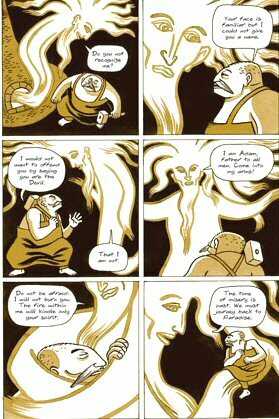 David B., though, is perhaps the greatest living comics writer/artist, and certainly the most mystical. His work draws heavily on portraying visual representations of internal and metaphysical states. He deployed these techniques at length in Epileptic (L’Ascension du Haut-Mal in French), his three-hundred hundred page chronicle of his brother’s severe epilepsy and his family’s life with it. At some point in the future, I will attempt to come to terms with the scope of David B.’s achievement of creating a visual weltanschauung as universal as that of any of the old masters. Here, though, are two little religious fables about crossing the gap between the human and the heavens, and the horrors therein. “The Armed Garden” is the more straightforward of the two. Jog describes it in detail here, but in brief, it concerns a Prague blacksmith, Rohan, who is subject to visions of Adam and Eve urging him to lead humanity back to paradise before the fall. We are now one with God; we are no longer held to observe the commandments! We have the right to satisfy all our desires! If you refuse me, I shall kill you but you will be the one at fault! Then the twist. Eve now appears to the militant Ziska, telling him, “Your brother Rohan has lost himself on the road to Paradise.” Ziska takes up arms and invades the garden, where they have regressed to a pre-human state of existence, having been absorbed into the trees, rocks, and ground. Rohan himself has undergone some kind of false apotheosis into a sun, and Ziska is able to destroy him with the aid of a talking goose. Though the mythos is Christian, the story uses a more ancient mode of divine-human interaction that is closer to Greek and Norse mythology. Rohan loses the approbation of the gods even as he embraces their words and leaves humanity behind; it’s Ziska, who remains human, who comes out the victor, along with the backing of Eve. This world does not exist! It is an illusion! The real world is behind this veil. But you cannot see it without perishing! Here, there is neither law nor religion. The violation of every law is the first step toward the real world. But unlike Rohan, the prophet is divine. He unleashes a literal flood of the skeletons of the victims and martyrs of injustice from all of history. The Caliph fights wisely and bravely, but he doesn’t have a chance. He’s only human. The eternal world is more real than the human world. It is hostile to humans in its very nature. This cosmology is a gnostic one in that the eternal world reveals itself subjectively and in pieces. Yet David B. seems ultimately concerned with the idea that it is precisely the illusory world that allows we as people to exist and to survive. Every incursion of the Real destroys us. Merely to touch the Real, as Ziska does at the end of “The Armed Garden,” is enough to blind one. People exist in the space between the Real and nothingness, condemned to see the world in lies and misunderstanding, and it is those fictions that form our very existence. Fictions keep the Real at bay, though it remains a constant presence. Hence the theme of compulsory, obsessive creation that underlies Epileptic. In addition to gnosticism, it’s also a Hermetic metaphysic. Hermeticism thrives or dies based on the ability of its advocate to enthrall the aesthetic appreciation of the reader, and David B. is sublimely skilled in this regard. 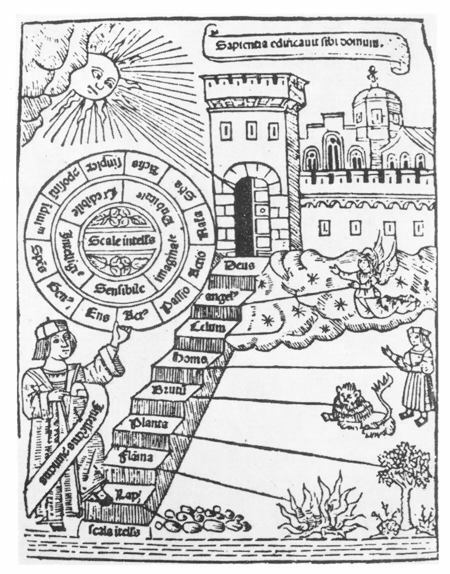 Hermeticism is particularly suited to the comics medium, just as Lull and Bruno communicated more intuitively and persuasively in their charts and graphics than they could in their writing. 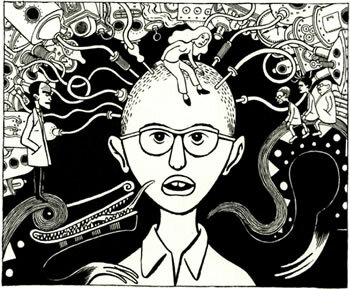 As for the source of David B.’s inspiration, I can’t say, not being a gnostic or a hermeticist myself, but I cannot deny the overwhelming reaction (illusory or real) that his world (illusory or real) is more freestanding than those of most artists, requiring less support from the shared assumptions of his culture, and that this is a crucial aspect of at least one sort of genius.